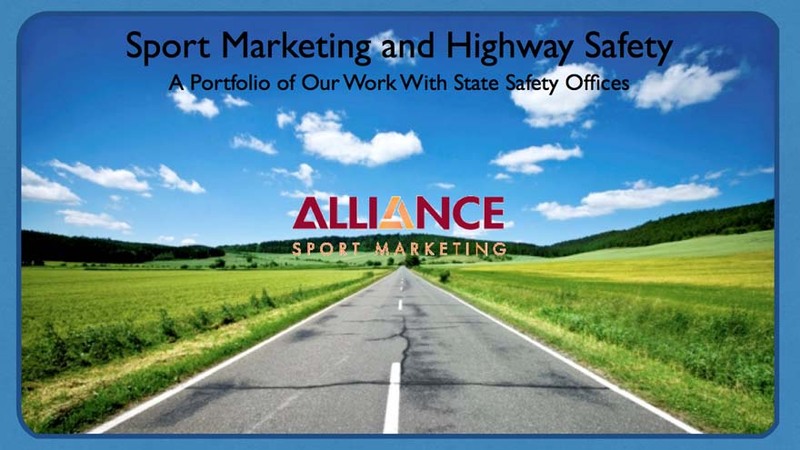 Since 2002, Alliance Sport Marketing has worked with Highway Safety Offices to coordinate their safety message through sports teams. Alliance Sport Marketing has worked with 13 state agencies to date, and are active members of the Governor's Highway Safety Association. 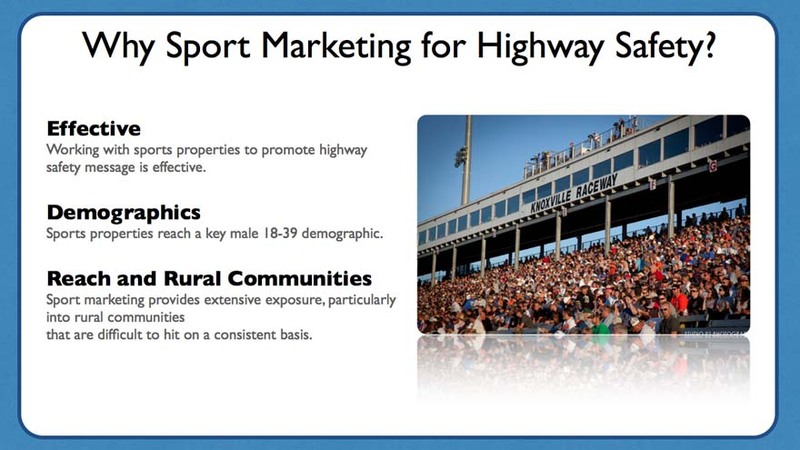 Sport Marketing makes sense for Highway Safety Offices because it is effective, it reaches a key demographic, and has extensive reach across the state. 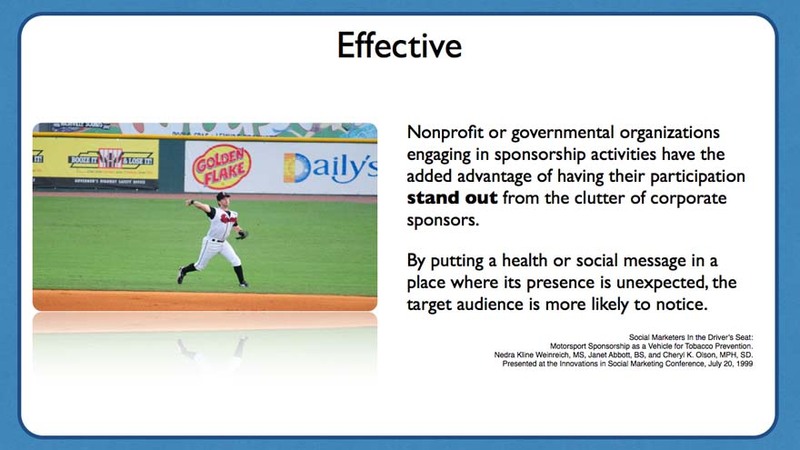 Sport Marketing is effective because it provides exposure through a 3-4 hour sporting event. Nonprofit and governmental organizations also have the benefit of standing out from other sponsors at a sporting event. 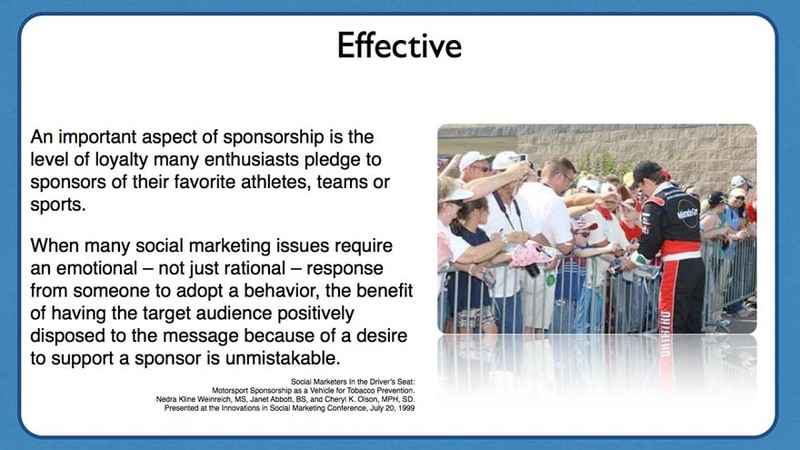 Sport Marketing is effective in changing behavior by using the loyalty of fans to engage an emotional response and positive feeling towards a social message, such as Buckling Up and refraining from Drinking and Driving. 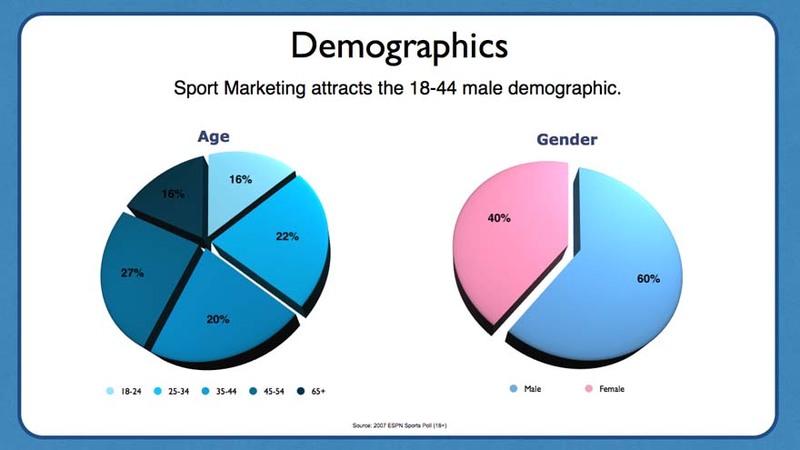 Sports attracts the male 18-44 demographic. In particular, motorsports, especially the smaller, local weekend racetracks, attract the young males prone to self-destructive behavior. 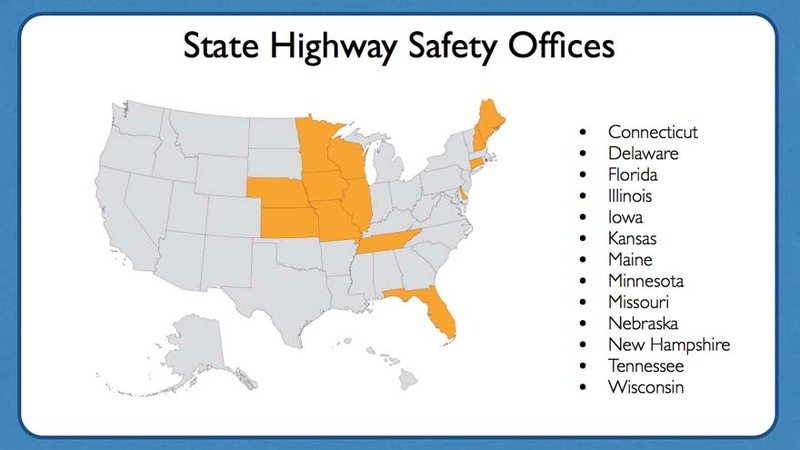 Alliance Sport Marketing is proud of our relationship with the Highway Safety Office, because we have seen the results from our partnership. 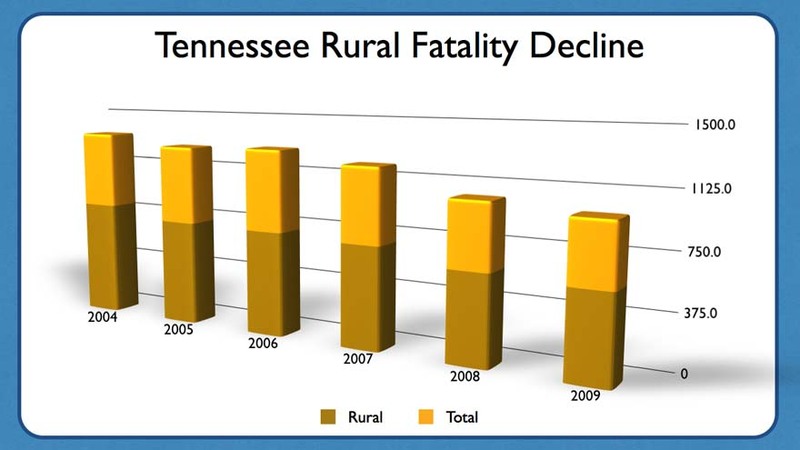 Tennessee has seen record declines in traffic fatalities since we began spreading the message through sports venues of the importance of Buckling Up and Designating a Sober Driver. 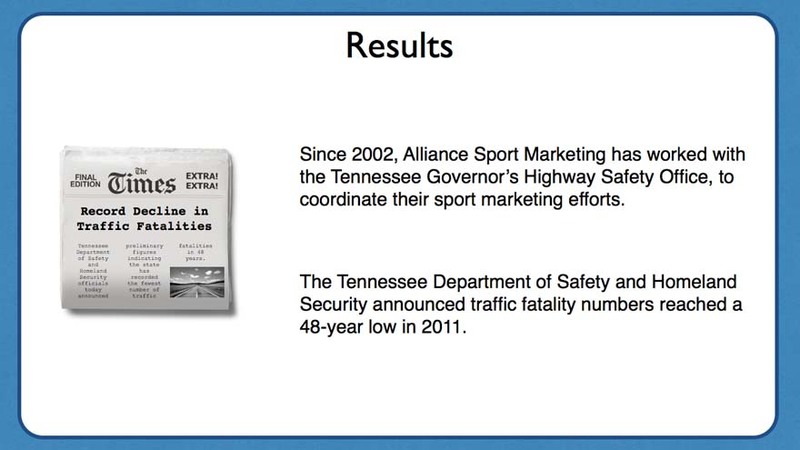 In 2004, the Tennessee Governor's Highway Safety Office partnered with Alliance Sport Marketing to create a program at motorsports venues across the state to target the young male demographic from the rural areas, as part of the "Buckle Up In Your Truck" campaign. While the messaging was changed, the impact has been obvious over the course of the nine year partnership. 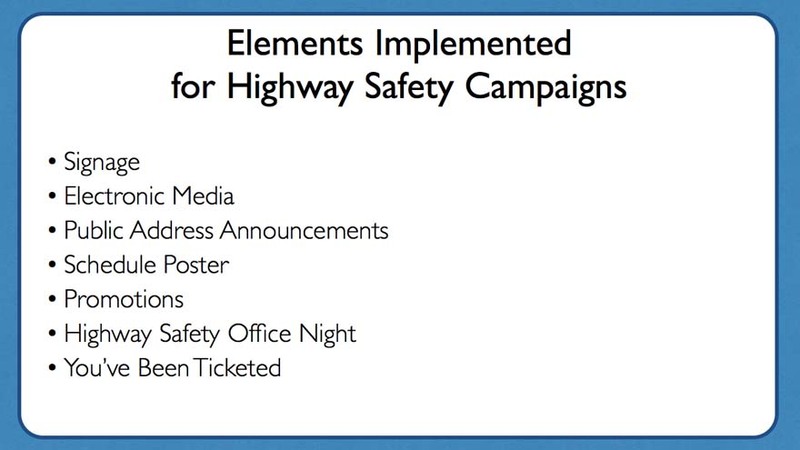 Elements utilized for Highway Safety Campaigns with each of the thirteen Highway Safety Offices we have partnered with. 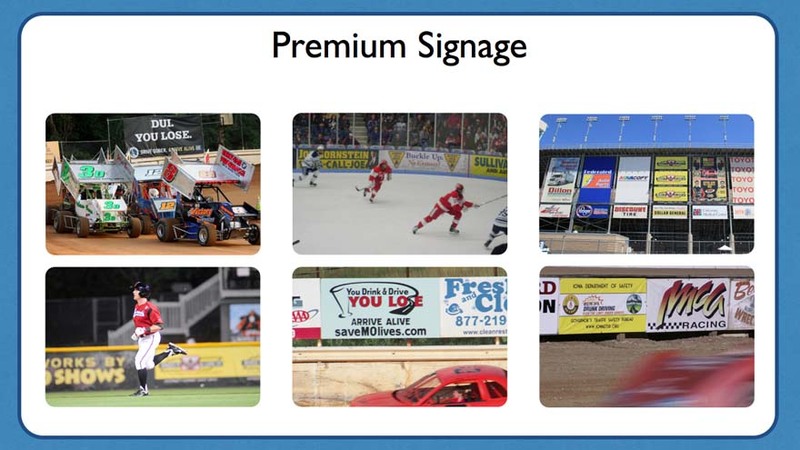 Premium signage opportunities, such as track side and outfield billboard signs, are placed in high traffic locations, providing maximum exposure and effectiveness. These signs are often visible throughout the sporting event, and attract attention from sports fans in attendance. Sometimes these signs receive additional exposure through television broadcasts, news highlights, and newspaper photos. Signage opportunities are not just limited to expensive, premium signs. 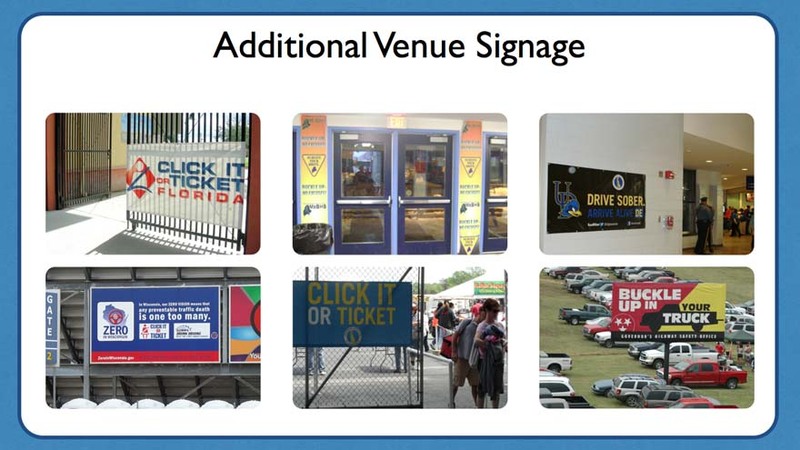 In-venue signs, strategicially placed throughout the venue can also be effective, and are not as expensive as premium signs. Exit signs are placed in high visibility traffic areas, and are often the last messages seen by fans as they exit the venue. Website advertising has been effective in spreading the message because it is the number one source of information for a team. Fans visit websites for information on their favorite team, schedules, and directions to the venue. These messages can be rotated and changed as necessary, without additional expense. 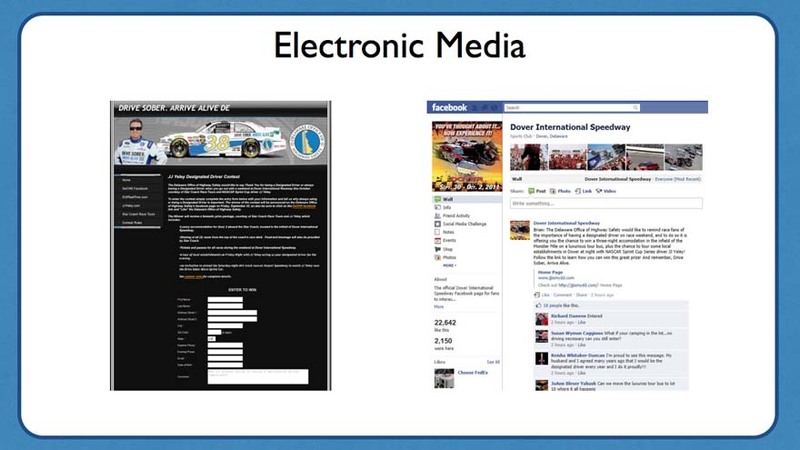 Additional website opportunities exist to interact with fans and promote highway safety. 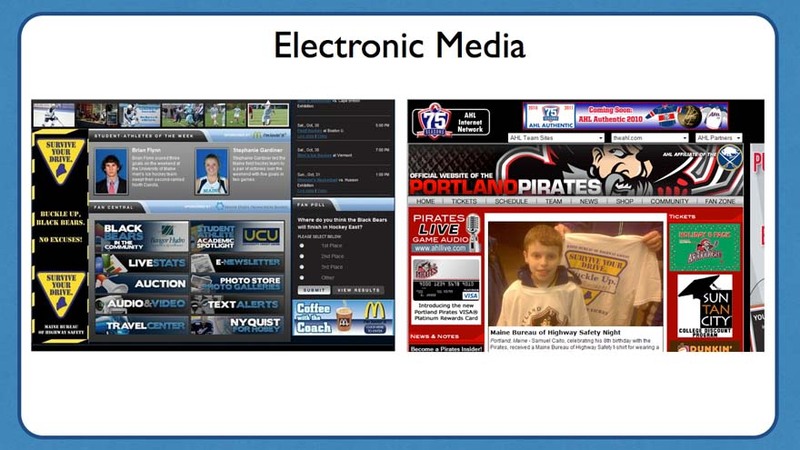 Online contests involving a sports partnership and Facebook and Twitter messaging is also effective in spreading the word. 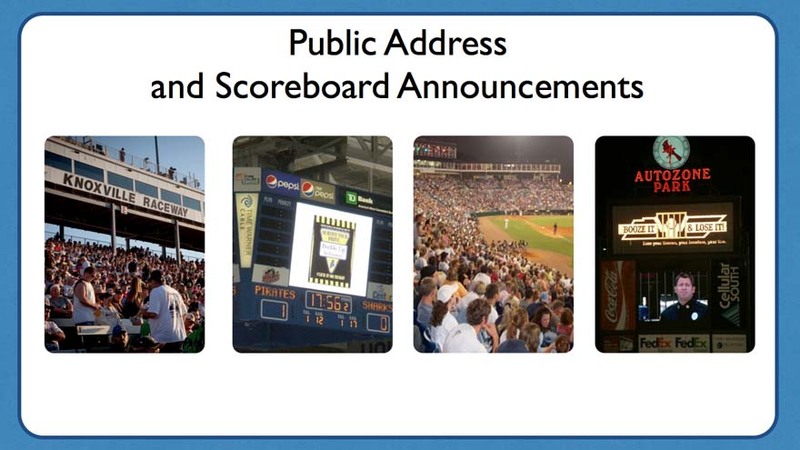 Public Address and Scoreboard Announcements are made during each event inside the venue. These announcements grab the attention of the fans between innings, races, or periods. Another effective tool has been schedule posters. These posters are printed for each of the venues, and distributed throughout the community, placed in high traffic areas, including bars and restaurants. This has been a great tool for receiving exposure in areas hard to reach, and has a positive reaction to the message. 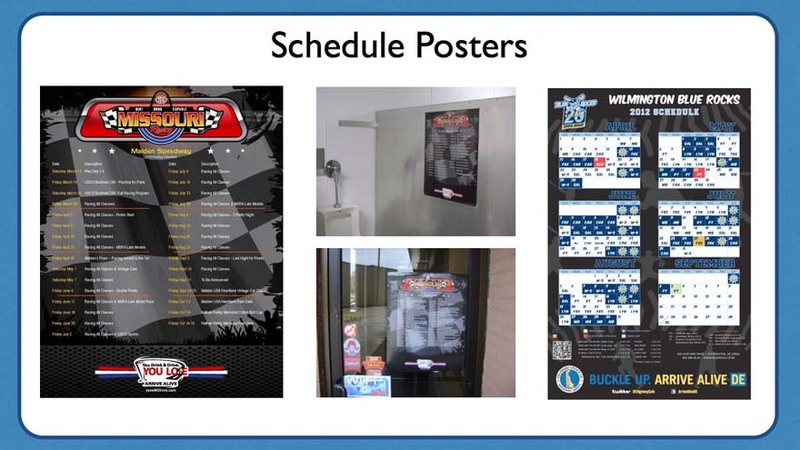 Schedule posters have a prolonged life, as they remain up throughout the season. 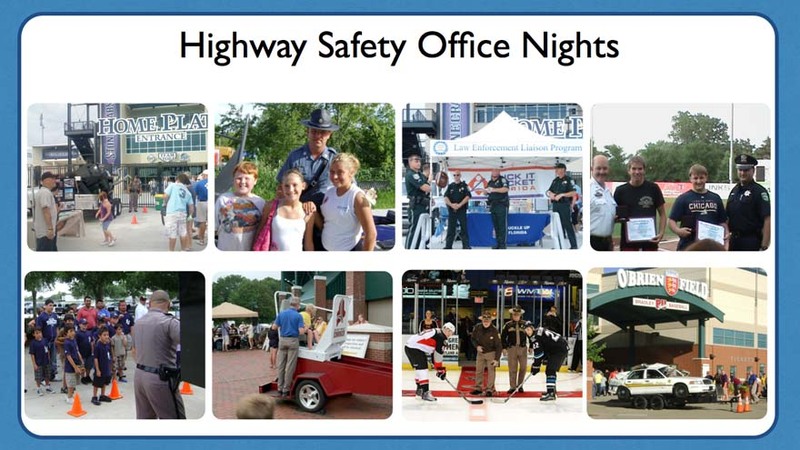 Highway Safety Office Nights have also been effective in interacting with the community on a positive level. Roll over and seatbelt demonstrations have been held outside venues prior to games. Tables with information on Highway Safety programs provide fans an opportunity to ask questions and collect information on other programs. First pitch and on-field ceremonies provide exposure to the fans and provide a positive message for both fans and local law enforcement officials. One of our favorite promotions is the You've Been Ticketed program. Here, local law enforcement officials are on-site prior to an event, checking for seat belt use as fans enter the venue parking lot. 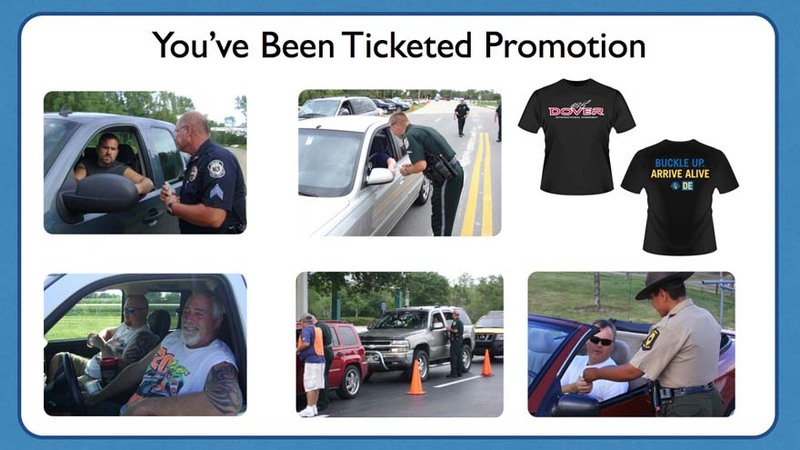 Fans caught wearing their seat belts are "ticketed" with tickets for an upcoming event or a voucher for a free T-Shirt. This promotion provides law enforcement an opportunity to interact with fans on a positive level, rewarding fans for wearing their seat belts. It also provides a memorable experience for fans to discuss with friends and family for weeks to come.